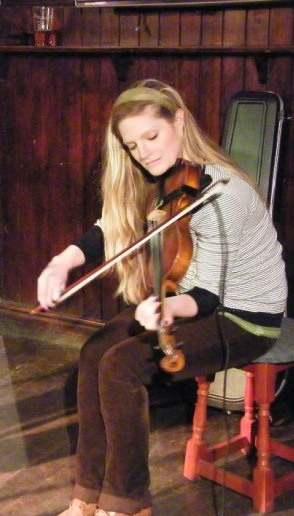 Katie Stone-Lonergan is a talented young musician fluent in both classical violin and the folk tunes of her native Ireland. Having originally moved to Somerset to study Music and Art at Bath Spa University, she remained in the local area following her graduation, pursuing a range of musical outlets including a memorable two month stint touring Europe with Australian folk-rock band The Wishing Well. Katie performs in a number of bands including the infamous rock trio Port Erin, the ceilidh band Out of the Brew and her own joint creative project, The Dizzy Hush, along with singer/songwriter Matt Warren. She has also recorded with The Proclaimers and the local band Temple Cloud. She recently become Musical Director of The Green Roofs Singers, as part of innovative and highly acclaimed theatre group ‘Kilter‘.